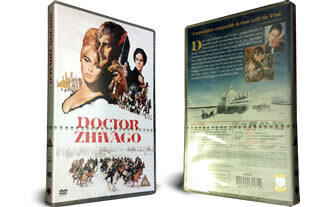 Doctor Zhivago Double DVD set, with an extra disc of special features. Eligable for FREE UK DELIVERY with Super Saver Delivery. Doctor Zhivago, is a masterpiece of epic filmmaking. Now in a widescreen print this is the ideal way to appreciate David Lean's craftsmanship and this movie's amazing cinematography. Maurice Jarre's "Lara's Theme" and the rest of his patchwork score can be heard in a music-only track, while Omar Sharif is joined by Lean's widow Sandra and Rod Steiger for an intermittent commentary. The second bonus disc contains an hour long documentary about the making of the film plus 10 shorter documentaries giving various insights into the location shooting and the cast and crew. A must have for any classic film fan.